Renee Blodgett is the CEO of Magic Sauce Media, founder of We Blog the World and an avid traveller. Renee created a really accurate CRM review of OnePageCRM and we’re proud to repost it to our blog. 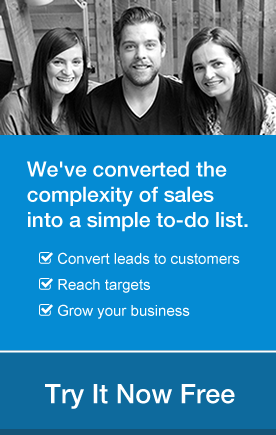 I’ve always been interested in CRM solutions, particularly ones aimed at small businesses. I find the expensive and complex tools like Salesforce, don’t really serve the SOHO market. I had a sit down with the founder of Irish-based OnePageCRM in Austin at SXSW . Michael FitzGerald seems to have the right approach to helping small businesses. By simplifying what exists out there and adding in the social bits that we all need in our daily outreach to customers, prospects, partners and more. He says that their solution is 100% focused on “sales actions.” Action is where we all want to take our ‘to-do’s’ as much as they’re often hard to get off the ever growing checklist. The problem with many of today’s solutions is that those follow up ‘action items’ get buried under other priorities. Often, we don’t always follow through as quickly as we should. Transfer that to a typical sales environment for a small business and that lack of aggressive follow up can make the difference between a closed sale on a hot lead to a hot lead turning warm or going with a competitor in the interim. Their approach was inspired by the GTD (Getting Things Done) philosophy. FitzGerald is a strong advocate of their system. He believes that applying the GTD way of thinking to CRM is the way to go. For those not familiar with GTD, it is David Allen’s time management system for productivity success and increased focus. What they want to encourage with OnePageCRM is upfront decision making on every contact. The team is focused on the professional services sector with their sweet spot targeting small businesses in the 5 to 25 employees. Their sweet spot he says, is around 3 users. Why? Based on their own research, typical accounts/people in a system have 3 people ‘touching’ it throughout its cycle (receptionist/office manager or assistant, the sales guy and a product liaison who is the technical eyes and ears executing on those customer’s orders and needs). Industries singing their praises today include: Business-to-Business Sales (designers, architects, engineers, lawyers, PR agencies, financial services firms, software IT and training), Consulting (management consultants and business advisers) and the most natural fit: Telesales(those dealing with outbound sales and marketing trade show follow ups). This ensures that leads and prospects are constantly being moved through the sales process to a successful win. If you think about it, CRM programs are often pretty flat and siloed. 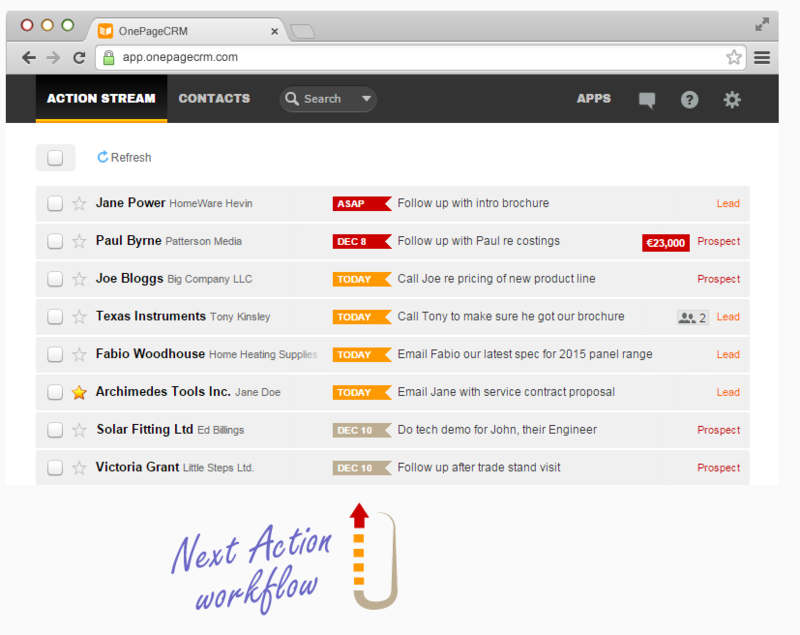 OnePageCRM sorts your contacts according to their Next Action and creates a dynamic list which prioritizes your time. By simplifying and decluttering the process yet making it dynamic at the same time, you can view the main screen quickly and figure out what actions you need to take now, today and tomorrow. The one page UI was designed with simplicity in mind. Often, information is buried in another layer that we don’t see and therefore don’t do. Out of sight, out of mind. By keeping everything on one page, FitzGerald says that it will ensure continued everyday usage. By storing and displaying only critical data and sales activity on one single page, the idea is that small business owners can more efficiently make forward moving sales decisions with clarity and ease. Rather than miss opportunities or forget about them, new customers are more likely and existing customers are retained. Ultimately, leading to increased sales, lower costs, and less admin. Salesforce is more ‘tab’ focused, which means that certainly there are deeper layers and more features and functionality. Though OnePageCRM doesn’t wish to compare itself to the market front runner. Rather, they’re focused on the SOHO market where there’s a gap. 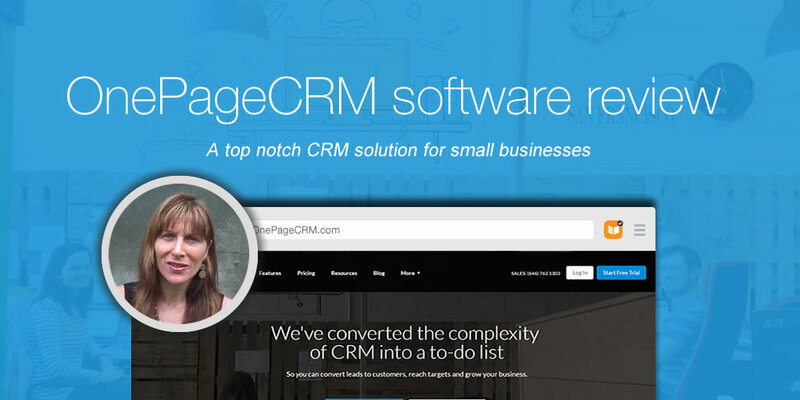 The team behind OnePageCRM feel their solution will be a huge “win” for small business owners around the globe. “With Salesforce, it’s the “kitchen sink” approach – everything is in there — which is overkill for a small business,” says FitzGerald. 1. Contact Management – There are tons of CRM systems out there but they don’t necessarily lead to more action or more sales. 2. 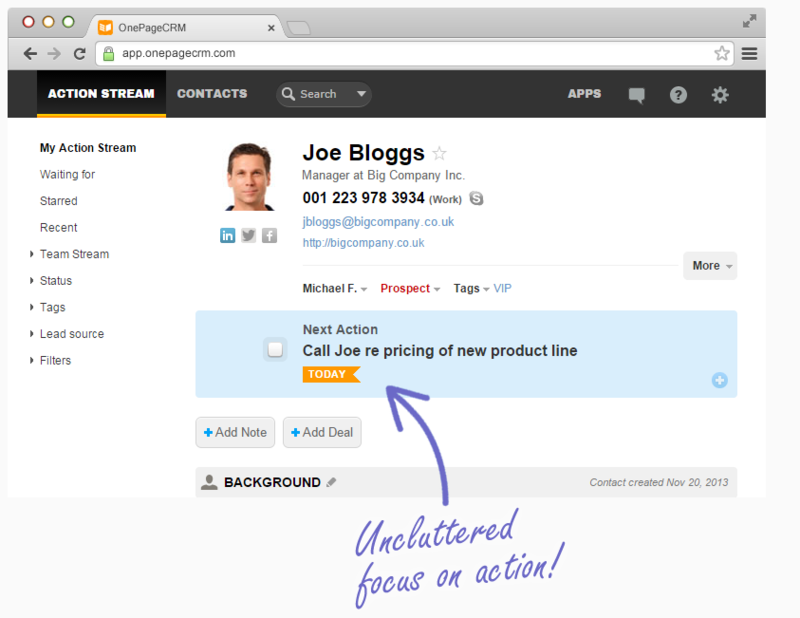 Deal Flow – This is the core sales piece of their system. Classify the deal, get a timeframe for the deal and then be able to do forecasting based on that data. (all in one easy-to-access window). 3. Custom Filters – A great added feature that allows you to only see leads and prospects from one region of the country as an example. 4. The last two — Marketing and Social – are coming soon, and we’re eager to see (and use) it once they’re added since, with these two features, it seems like a perfect solution for any small business owner regardless of what part of the world you live in. Marketing and social are the cherry on the cake so to speak. Fitzgerald emphasizes with a smile, “We’re all about having an uncluttered focus. A next actions focus. A trusted system focus.” And, I have to admit, their UI was crisp and easy to navigate. Renee Blodgett is CEO of Magic Sauce Media, founder of We Blog the World and an avid traveller. worth reading it. Interesting post!! Good article. Here in Ex Ordo, we use OnePageCRM and it is a joy to work with. At a glance, the system highlights the next immediate action for each potential sale or customer. This helps us take the next step with each contact and at the same time keeps our prospective customer list current and up to date. Zoho contactmanager & OnePageCrm as the finalists. 2 way contact sync by 3rd party namely,piesync 19usd that too when a monthly subscription of OPC costs me 12usd .ZCM lets me sync my newly added contacts superquick N no of times a day. Please fix these two major things as most of small business are looking for ONEPAGECRM.